The results of a systematic study of sorption systems for the reversible group extraction of Ru, Rh, Pd, Ir, and Pt and their subsequent determination by inductively coupled plasma mass spectrometry are presented. The sorption system includes an sorbent, a reagent, and a desorbing solution. Purolite MN-200, НP, and Styrosorb hypercrosslinked polystyrene sorbents and Strata sorbents with immobilized nitrogen atoms were studied. Various aliphatic and aromatic amines were used as ion-pair amine reagents for the sorption extraction of PGMs. A possibility of the desorption of Ru, Rh, Pd, Ir, and Pt complexes with reagents of different nature was studied. Sorption systems were selected for the preconcentration of PGMs from solutions obtained after the decomposition of rocks. A flow-injection method for introducing high-salt and organic solutions into a mass spectrometer was proposed. Possible spectral and nonspectral effects were investigated, and the conditions for quantifying Ru, Rh, Pd, Ir, and Pt in the obtained preconcentrates were selected. 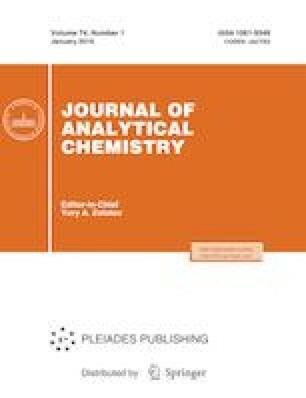 The studies were supported by the programs of the Presidium of the Russian Academy of Sciences 2010–2015 “Creation and Improvement of Methods of Chemical Analysis and Research of the Structure of Substances and Materials” and 2015–2017 “Chemical Analysis and the Study of the Structure of Substances: Fundamental Principles and New Methods” and by the Russian Foundation for Basic Research, project nos. 12-03-00804 and 16-03-00428.